Tasting Room and Location: Five miles west of U.S. 101 via Santa Rosa Road exit. Knowledge and Helpfulness of the Person Pouring the Wine: Susan, the person pouring the wine was friendly, helpful and enthusiastic. Although her knowledge of wines was limited, she did enrich the experience and our knowledge of wines. Recommendation from the tasting: This is a vineyard and tasting that should not be missed. Comments: A visit to the Alma Rosa Vineyard is a noteworthy experience. The location may be one of the most magnificent, pictorial valleys in California. 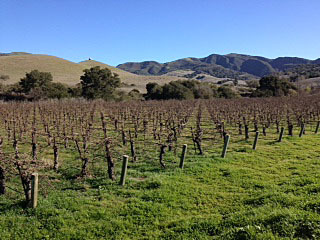 The rolling hills and vine covered valleys provide a setting that is simply inspiring. The tasting room is down a long gravel driveway that winds through vineyards, groves of native trees and fords a creek. The tasting room is a converted tin-roofed 1920’s dairy barn that provides a feeling of a rustic Mexican hacienda. With a setting like that the only other thing that can be said is that the wines were GREAT!!! In addition to the regular tasting Susan gave us the opportunity to compare the 2009 and 2010 Mt. Eden Clone, El Jabali Vineyard Pinot Noir. There is nothing like side-by-side testing to really taste the subtle differences in complex Pinot Noir. We were there on a week day and our tasting was very relaxed with just one other couple; however, Susan said the tasting room was packed with people during the weekend…we would recommend a week day visit.